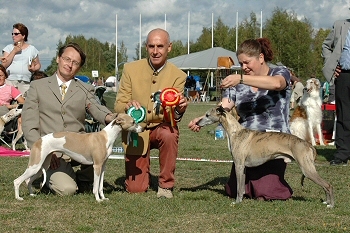 Whippets were judged by Vladimir Aleksandrov, Russia. 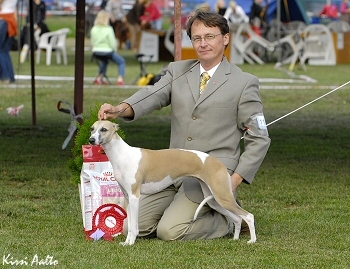 Group judge Nils Molin, Sweden. It's already December. We don't have snow anymore so it doesn't feel like winter at all. But the puppies are still eagerly sniffing and exploring everything. Take a look at some photos. Salttu, Whiptails Salt'n Pepper has become a proud father of seven puppies, 4 boys & 3 girls! 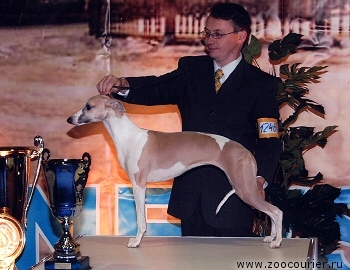 The litter's dam is Usva, Ch Carry On Lucilla. 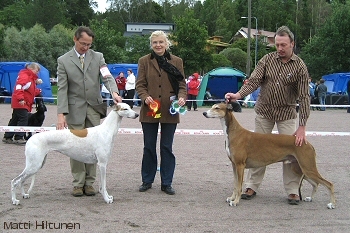 You'll find more information about this litter in the Razamanaz Whippets homepages. 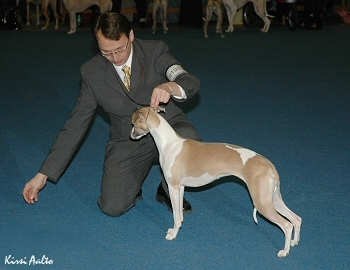 Winnie, Whiptails Winter Winsome EXC/1, Best Dog, CC, cacib, BOB, BIG-4. New Fin & Est Ch!! 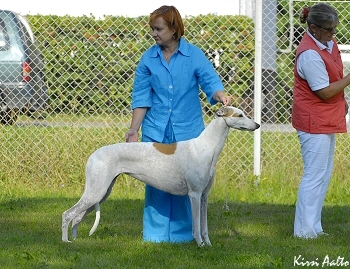 Congratulations Pirkko and Timo for a new Champion! 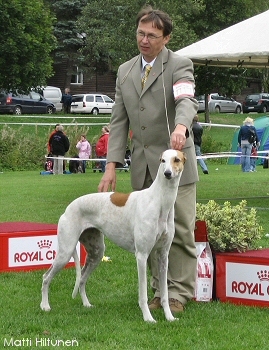 1st Pimu, Whiptails Winter Rose 250 + 259 = 509 points, CC, HSKP district area champion 2006. Congratulations Anna & Pimu for the great result! 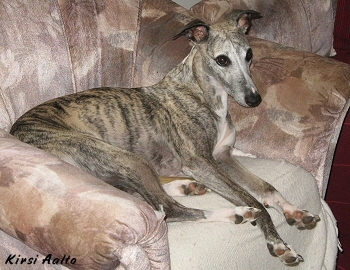 23.09.2006 Hertta celebrates her 3-year-old birthday today. Happy birthday, Hertta & sisters! 21.09.2006 Honey's puppies were born! 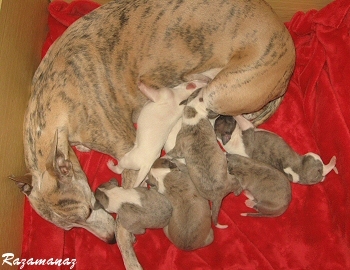 18.09.2006 Hertta's puppies were born! 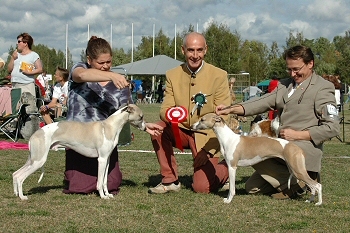 Whippets were judged by Anette Bystrup, Denmark. 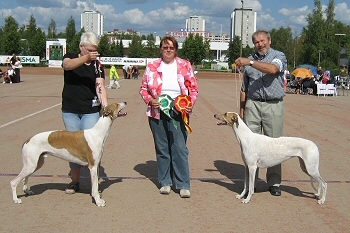 Group 10 was judged by Tuula Savolainen. Especially thanks to Mariikka, Seija and Saija for great handling help! 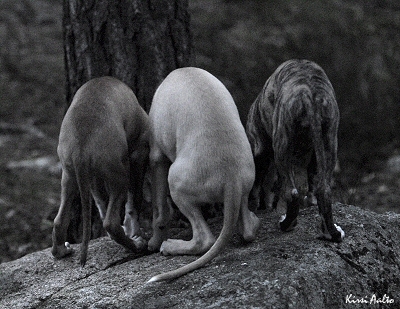 Sari has taken really nice pics about the boys (Riku, Woody, Salttu & Neo & in addition Elli) having some fun! Take a look at the photos. 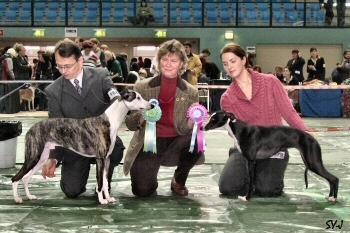 Mojo, Int Ch Taraly Stairway To Heaven returned back home to France. Our home doesn't feel the same without him. Heartfelt thanks to Tamara & Taraly family for your friendship and for entrusting us this charming boy. It was a great pleasure to get to know him so well during this summer! Good luck in the future!! After the show trip in Sweden, we spent a lovely summer vacation time in Ilmajoki and both the dogs and us enjoyed it a lot! 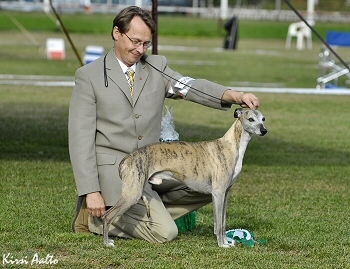 We were taking photos in LAGU's agility competition on the 5th and 6th August. 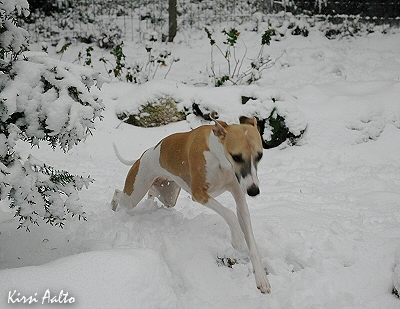 It was quite fun to watch how much the dogs enjoyed it! 25.07.2006 Happy 1-year-old birthday Emil, Ida, Kille, Salttu & Wili!